South Lake Hospital gave a sneak peek at its new, first-ever freestanding emergency department on May 18. 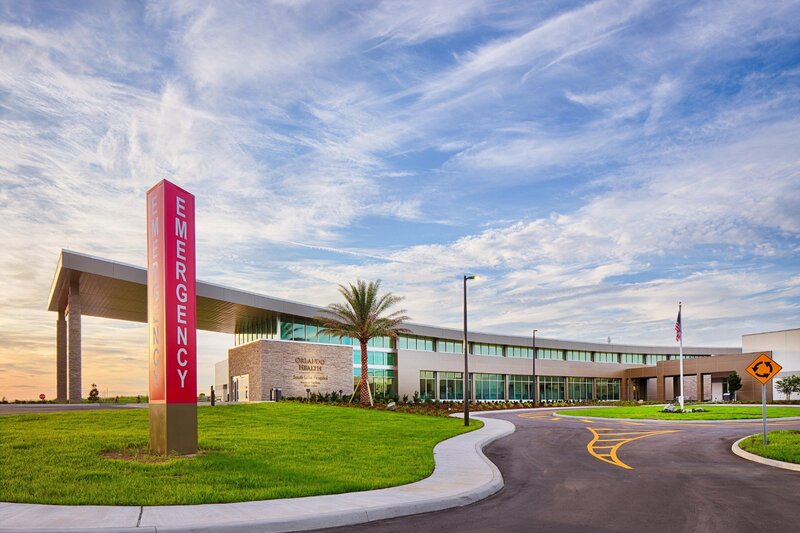 The $12 million freestanding ER and medical pavilion, dubbed the Orlando Health South Lake Hospital Emergency Room and Medical Pavilion – Blue Cedar, is on 20 acres at the corner of U.S. Highway 27 and Florida’s Turnpike in Leesburg. The 20,000-square-foot freestanding ER, which will open June 6, is owned and operated by South Lake Hospital. It offers the same comprehensive 24/7 emergency services as a main hospital’s ER would however, if a patient needs an extended stay, they will be admitted into that main hospital. The freestanding ER at Blue Cedar features 12 treatment rooms, a specialized resuscitation room for infants, children and adults; diagnostic imaging such as ultrasound, X-ray and computed tomography; laboratory services and a helipad. Meanwhile, the adjacent 20,000-square-foot medical office building that’s connected by a covered pathway will open in September. It will house physician offices offering primary care, cardiology and other specialties. The number of such facilities is on the rise in Florida, partly because of overcrowded ERs on hospital campuses. The state had only 26 freestanding ERs in 2016 and that number has grown to 41, according to the Florida Agency For Health Care Administration. The total count will rise to 50-plus with several new Central Florida projects and may go even higher, since they fulfill a strategy for hospital systems to grow revenue by bringing emergency care closer to outlying, typically affluent suburbs, where people are more likely to be able to afford health care. The 140-bed South Lake Hospital’s main campus in Clermont is roughly 14 miles north of the freestanding ER. South Lake Hospital also is underway on a second freestanding ER in Four Corners— where Lake, Orange, Osceola and Polk counties meet. The 12,000-square-foot-plus Four Corners ER is 14 miles south of the Clermont Campus and is scheduled to open early August.